Gamera III: Awakening of Irys (1999) – SKREEONK! You’ve never seen Gamera like this before. 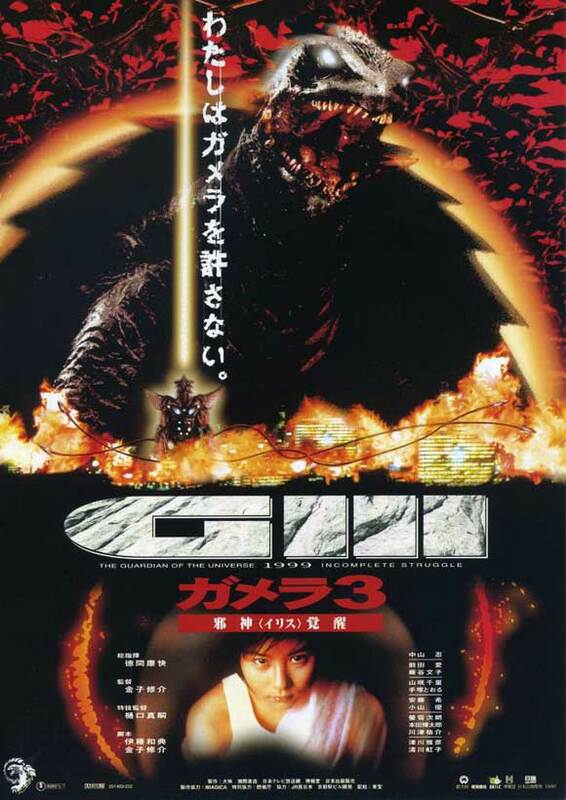 Also known as Gamera 3: Revenge of Irys, the film was originally released as Gamera III: Awakening of Irys (ガメラ3 邪神〈イリス〉覚醒 Gamera Surī Jyashin Irisu Kakusei). The year is 1999. The Gyaos are slowly making a comeback, as Dr. Nagamine investigates the corpse of a Hyper-Gyaos in a village near the equator. 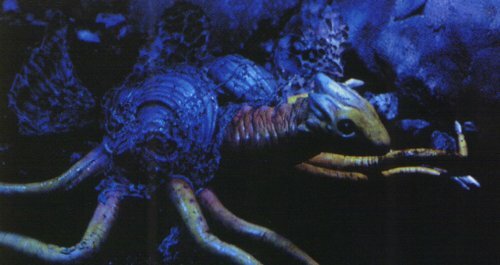 Meanwhile, an unmanned submarine is searching the ocean floor when it comes across numerous Gamera skeletons. A local schoolgirl is bullied into searching a cave for a monster. After removing a large stone, another stone mysteriously appears which turns out to be an egg, which in turn hatches. The girl names the rather cute creature Iris, and plans to use him for revenge against Gamera, who was responsible for her parent’s death when the Gyaos attacked. Gyaos appear in the night sky over Shibuya, with Gamera in hot pursuit. Blasting one out of the sky with a fireball, he lands to finish the creature off. Others appear, and the result is the near total destruction of Shibuya, with thousands of lives being lost. The military decides to attack Gamera, and he is chased into the open sea. Meanwhile, Iris, who turns out to be a Gyaos mutation grows and swallows the girl, attempting to merge with her nervous system, only to be saved by the land-owner’s grandson. Afterwards, she is taken to Kyoto. Iris, meanwhile, grows to enormous size and heads for Kyoto, following the girl. Gamera arrives and does battle with Iris in the sky, but is attacked by the SDF and loses altitude heading toward the city. Iris lands and begins making his way to the girl’s location, deflecting Gamera’s airborn attacks and causing massive destruction in the process. Finally, Gamera catches Iris, and Gamera is run through by one of Iris’s scythe-like hands. As Gamera lay on his back, the boy arrives and tries to save the girl again, this time succeeding in breaking her trance. Before she can run away, Iris swallos her again. 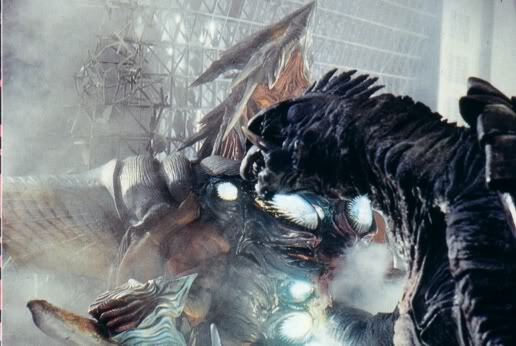 Gamera attacks Iris, plunging his hand through Iris’s chest and grabbing the girl. Iris retaliates and pins his hand against a wall. 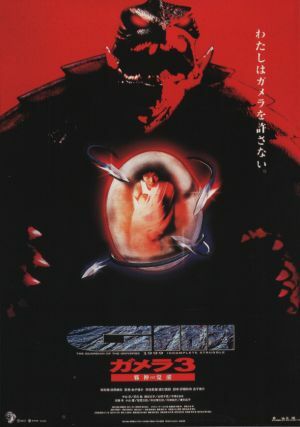 Gamera is stuck; one hand holding the girl inside Iris’s body, the other unable to move, and Iris about to fire with his tentacles. Gamera turns and blows his arm off, refusing to sacrifice the girl to save himself. Now free, one hand full of the girl, the other gone completely, facing down the evil Iris, Iris readies his weapon and fires. Gamera blocks the fire with his severed hand, and manipulates the fire into a new hand and throws the final deadly punch to Iris, killing him. Gamera sets the girl down and watches as Nagamine and Asagi try to revive her, to no avail. Gamera lets out a loud cry, and she awakens. 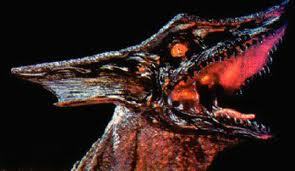 Back at the SDF headquarters, a call comes in from several sources that a huge flock of Gyaos are descending on Japan. The girl saved, Gamera readies himself for the next battle, refusing to ever give up. The Gyaos are back…They brought a friend…and a really bad attitude. The final film in the nineties Gamera trilogy had a little darker tone to it than the first two. Obviously a sequel to the previous film, Advent of Legion, it is more closely connected with the first film, Guardian of the Universe. 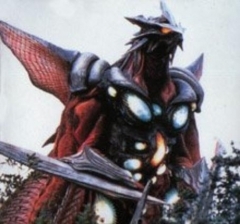 The Gyaos have returned, and along with them comes a new foe; a Gyaos hybrid, Iris. 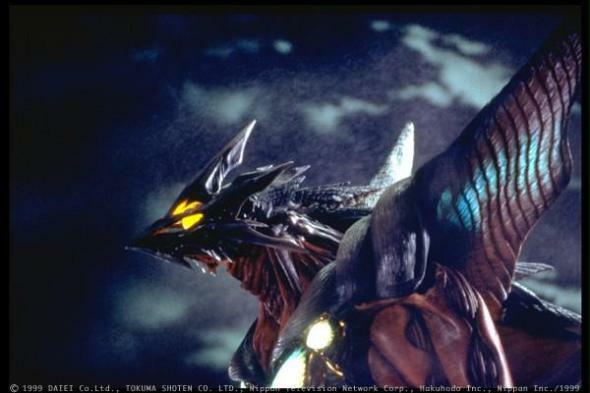 The story of the cause of Gyaos’s return is an intriguing one; Gamera’s mana beam drains the earth of its mana, or life-force, and the result is a downgrade in the environment, once again creating an ideal scenario for their return. Gamera’s attitude has changed as well, as he viciously destroys almost an entire city to dispatch two Gyaos. Still, throughout the course of the movie he further punctuates the tragic nature of his character; he has the weight of the world on his shoulders, and will stop at nothing to protect it even when facing impossible odds, carrying on the concept from the previous installment and taking it a step further. The Gyaos have evolved from a nearly extinct species into an infestation, which adds to this feeling. The final scene in the movie, with thousands of the evil reptiles converging on Japan and Gamera preparing for another battle even after losing an arm is a masterpiece of mood. The mystery surrounding the Ryuseicho, which is later perceived to be Iris, involves a story of monster guardians of the north, south, east and west. It was an interesting concept that would be used again two years later in Shusuke Kaneko’s 2001 Godzilla film, Godzilla, Mothra, and King Ghidorah: Giant Monsters All-Out Attack. The characters: Once again, there aren’t many characters in this movie that are boring. There are some recurring characters, as well as some interesting new ones. The story basically centers on the estranged Ayanna Hirasaka, who in 1995 lost her parents during Gamera’s final battle with the Gyaos. She now lives with a foster family along with her little brother, and retains a strong hatred for Gamera. When she discovers Iris, she plans to use him to kill Gamera. Only after she is captured by Iris and saved by Gamera does she change her mind. Dr. Nagamine returns in fine style, and along with Asagi, they try to solve the mystery of the Gyaos’s return. Inspector Osako returns also, having quit his job after the Legion attack and becoming a homeless man. Nagamine pulls him out of his despair and allows him to help, once again giving him a purpose to live. Moribe, the grandson of the guardian of the Ryuseicho tries to help Ayanna see that Gamera is good, and portrays his character very well. He rescues Ayanna from Iris the first time, but is injured during his second attempt; but survives to comfort Ayanna after she is broken from her trance and realizes her mistake. The new characters Shin’ya Kurata and Mito Asakura, both believers in the paranormal, add a level of mystery and fun to the story as well. The monsters: The character development doesn’t stop with the humans. Gamera, as stated before, will stop at nothing to defend against threats to the universe. Iris will stop at nothing to retrieve Ayanna and attempt to connect with her. The monster suits in this entry are superb. Gamera takes on a more vicious appearance; he sports a much smaller head with a nasty snarl, and every sharp tooth in his maw is visible. His pupils are small, giving him a wild and destructive expression. His body remains the same, and it is an impressive sight. Iris is an odd-looking monster with long blades for arms and several tentacles. At the end of each tentacle is a scissor-like claw from which his energy weapon is fired. His head is tapered with spines protruding from the top, and his face looks like a warrior’s mask of sorts. The Gyaos are portrayed through the use of computer animation. The special effects: As for the first two movies in the trilogy, the special effects are nearly flawless. The Destruction scenes are over-the-top; the explosions, the shots of the people being caught or crushed by falling debris, and the shake of each footstep. The special effects team makes it appear as if it were actually happening, and went to great lengths to do so. There were several computer-animated scenes in the movie. All of the scenes of the monsters flying were animated, and were done so with near perfection. Gamera’s initial appearance; his head popping out of his shell and dropping to the ground were astounding. Iris’s ascent above the clouds is somewhat cartoonish, but the viewer hardly notices. The shots of Gamera flying are superb; the attack on him mid-air, his descent over Kyoto, and his burst of energy as he tries to catch up with Iris over the city. The Gyaos were quite possibly the most impressive computer graphics in the movie. They looked very realistic, and their very fluid movements as they flapped their wings were a vast improvement over the first film. Seeing them all converge on Japan in the final shot of the movie was an awesome spectacle. The Music: The music in the film cannot compliment the grim tone of it any further. Every theme fit their respective scenes with perfection. The final theme, as Gamera looks into the sky ready for another fight is possibly one of the most powerful, but as a whole the score is a hit. The positives: The pace of the movie is even, the special effects are spectacular, and the score is fitting. The characters are enjoyable, and the monsters were very well detailed. It is a film worthy of the title of greatness. The negatives: Once again, there is a loss of words when addressing anything ‘bad’ about the film. The monster battles were a little short, but were so action-packed that the viewer tends not to notice. The ending, while exciting leaves the viewer with an empty, unfinished feeling. Don’t you just hate cliffhangers? One just itches to know what happens next, and that was probably the worst thing about the film. A personal view: It’s no secret, I’m a fan of Gamera. This is my favorite Gamera movie, and quite possibly my favorite monster movie of all time. This is also my favorite Gamera suit. I liked the vicious look of it, despite Gamera always being a hero and the friend of children. I enjoyed this film more than I enjoyed the previous two, and can’t see myself losing interest anytime soon. Critically, I give this film a four and –a-half. For personal entertainment, this one gets a perfect five. 1999’s “Gamera 3: Revenge of Iris” is easily the darkest chapter in the entire Gamera franchise, not just the trilogy it concludes. Despite the defeat of Legion back in Gamera 2, earth is in greater danger than ever, as sightings of new and improved Hyper Gyaos are reported all over the world, the film opening with a young Gyaos carcass being found in a village, while elsewhere an entire graveyard of Gamera fossils is discovered on the ocean floor. These images let the viewer know right off the bat that something is seriously wrong and that this shall be a different experience altogether from the last two movies, a definite sense of ominous foreboding filling it’s atmosphere. Gamera faces not only his old nemesis however, as the military once again considers him a threat to humanity after a battle against Hyper Gyaos results in heavy civilian casualties and a new monster, Iris, awakens in a village shrine, drawing power from a teenage girl with a grudge against Gamera, who killed her parents years earlier during the fight against Super Gyaos. This all culminates in a grim fairytale that will keep you guessing from beginning to end, and believe me, the end of Gamera’s three part saga will leave you speechless. Everything about this film excels from the storyline and acting to the monsters and special effects. Many familiar faces from past installments return for this film, including Shinobu Nakayama, who reprises her role as Ornithologist Mayumi Nagamine, the trilogy’s Gyaos expert, as well as Gamera’s former link to humanity, Asagi Kusanagi, played again by Ayako Fujitani. Both leading ladies breath new life into their characters as they work together to unravel the many mysteries of Gamera, Gyaos, and Iris before its too late and the doomsday clock runs out. Asagi is of special interest since she wants to help but has to struggle with knowing her bond to Gamera is broken after the events of Gamera 2, armed only with her faith that Gamera ultimately has the planet’s best interests at heart. Even the comical Inspector Osako returns, actor Yukijiro Hotaru portraying him much more seriously than before as a man down on his luck after all the kaiju attacks he’s lived through, Mayumi giving him the confidence to get back in the saddle and help her investigate this latest threat. Even Mr. Saito is back, as snide as ever, but more helpful than he was during the first Gyaos invasion. Ai Maeda does a wonderful job as the sad and angry Ayana Hirasaka, excellently conveying a girl consumed by grief and hatred for Gamera, turning to Iris for kinship on her mission of vengeance. Senri Yamasaki and Toru Tezuka play the roles of newcomers Mito Asakura and Shinya Kurata, a couple of eerie, amoral characters who’s motives are unclear at first as they work behind the scenes…Against Gamera?! 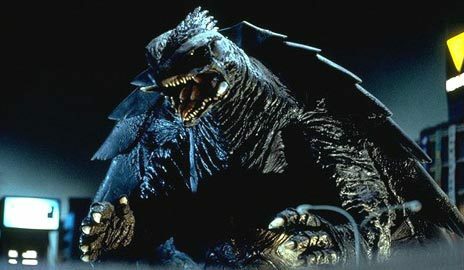 To sum things up, “Gamera 3: Revenge of Iris” is a shining example of the kaiju film genre and what can be accomplished with newer suitmation techniques combined with computer graphics, with a controversial, emotional ending that shall leave you either satisfied or wishing for more. Posted on September 12, 2011 0 By Jon D. B.	Daiei Movie Reviews! Posted in Daiei Movie Reviews!, Kaiju Movie Reviews! Next Post September is Monster Month @ ToyFreakz! Its a Collector’s Update! Previous Post Anguirus! Gamera! Go Hero! Its a Collector’s Update!